This is a follow-up from my October 6 post called Girl Archetypes. The secret is I was already working on the book, and now, it's done! Woo! From the tiny germ of an idea to a finished thing! 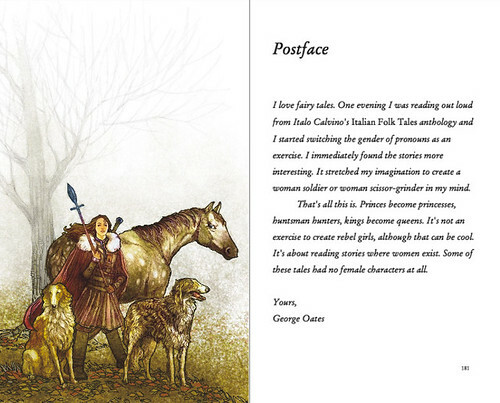 Here's the postface from the book, including a fabulous huntress and her animals, illustrated by Kevin Nichols, who made me some beautiful illustrations. It's probably the simplest explanation of why I made this. I love fairy tales. One evening I was reading out loud from Italo Calvino's Italian Folk Tales anthology and I started switching the gender of pronouns as an exercise. I immediately found the stories more interesting. It stretched my imagination to create a woman soldier or woman scissor-grinder in my mind. That's all this is. Princes become princesses, huntsman hunters, kings become queens. It's not an exercise to create rebel girls, although that can be cool. It's about reading stories where women exist. Some of these tales had no female characters at all. I've had a lot of fun over the last... six months or so, gathering stories, editing them, finding Kevin, art direction on the illustrations, laying out the book, proofreading, and finally, now, telling everyone about it. Please do buy a copy, if you can. 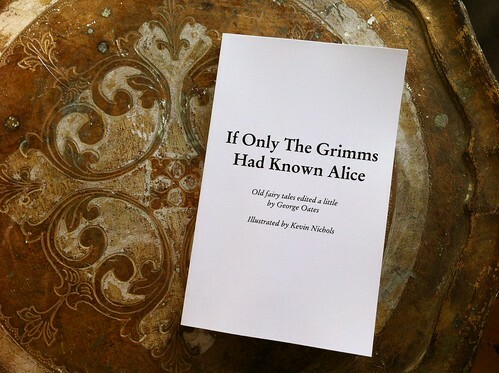 The stories are an interesting challenge for your imagination, and because of that, I don't think it's just for kids.